Discovering the Ancients is designed to teach and guide students in gathering valuable information about desert plants which will expand the data available for scientific evaluation, calculation, and speculation. Student participants in this program receive in-class orientation, a field trip for data gathering, and post-field trip instruction in the pilot program being conducted in Joshua Tree National Park. This is an opportunity for students to engage in data collection that serves the national park, its guests, and the scientific community into the future while contributing to a community network designed to raise awareness of the valuable heritage of ancient native plants across our southwestern deserts. Teachers who would like their students to participate in this program should visit www.discoveringtheancients.org. In some cases, students are measuring desert plants for which we currently have no reliable means of determining their growth rates or life-spans, even though evidence suggests that many individual desert plant species routinely reach hundreds to thousands of years in age. Individual ancient plants that students locate, map, tag, and measure can be tracked over many years to document growth rates and to better estimate or calculate ages and life-spans of ancient desert plants. GPS (global positioning) information will allow students to revisit individual plants to measure growth, calculate rate of growth over time, and estimate plant age and life-span. Discovering the Ancients Student Field Kits are provided to students participating in this field curriculum program to collect and record their field data. 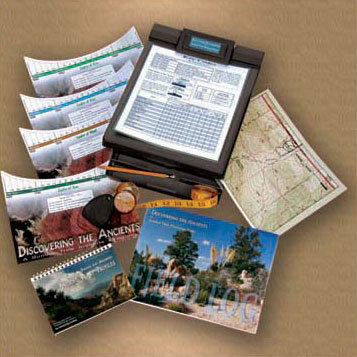 This field kit includes plant identification booklets, charts with definitions and key instructions, maps, transect locations, field data log sheets, innovative new field tools to measure plant dimensions and estimate plant age, and a 24-page full-color Student Field Log for the student to keep. Students participating in this program can enter their field data online at the Discovering the Ancients website. These field measurements may be viewed online by other students, educators, research scientists, and the general public. From these measurements, the growth rates and ages of many desert plants may be estimated, giving a clearer picture of the maturity and resiliency of these ancient plants. Results of this long-term study performed by students may enable us to better understand the secrets of these ancient desert inhabitants, some of which may have been growing since before Columbus landed on the shores of America. To learn more about this program visit www.discoveringtheancients.org.